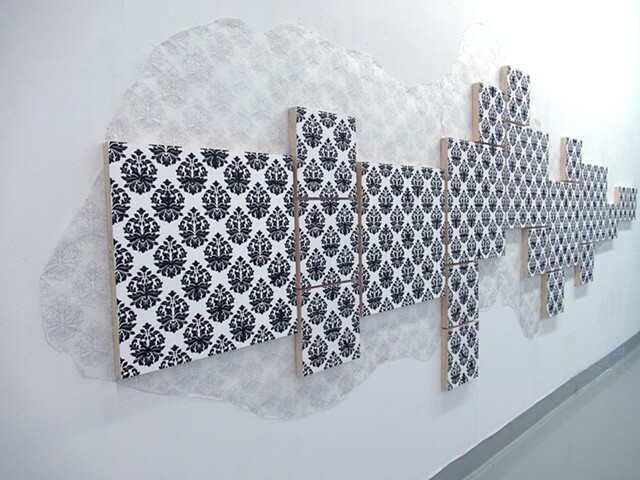 20 screen printed wood panels, (340) 1:18 scale toy guns, graphite on tracing paper, map pins. Based on gun violence statistics, 340 toy guns are camouflaged within the patterns representing the number of lives loss to mass shootings in 2018. The damask wallpaper patterns create a sense of familiarity and reference the comfort of home, which becomes unsettling with the addition of weapons. Conceptually the installation uses a black and white palette addressing the morality of gun ownership and the ease of purchasing a weapon in this country.